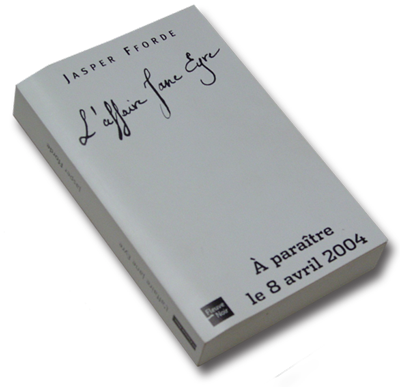 L'affaire Jane Eyre, the French language proof edition of The Eyre Affair. Published by Fleuve Noir in April 2004. Translated by Roxane Azimi, this is the first foreign language version I actually attended the launch of, in Paris, on the 7th April 2004. In the back there is a helpful copy of 'Daffodils' in French and English and a footnote explains how there isn't a chaper 13, named "L'eglise a Capel-y-ffin" or otherwise. The proof is, as far as I can see, identical to the retail copy. 387 pages, ISBN: 2-265-07653-8.